There are many congregations that place both the American Flag and the Israeli Flag on the Bima and there are many congregations that do not. Just as the American Flag represents the support for the United States so does the Israeli flag represents support for the state of Israel. However different meanings can be derived from the Israeli flag on the Bima. 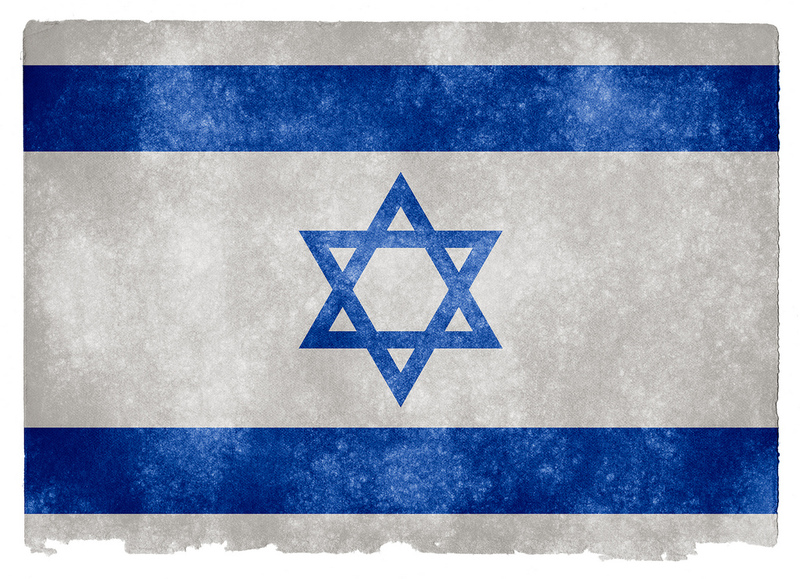 The flag could be thought of as a symbol for Judaism. The flag could mean a general support of the relationship between North American and Israeli Jews. The flag could also represent a tacit agreement to the government of Israel’s policy decisions, including decisions of security and settlement. These are only a few examples, the Israeli flag is rich with meaning and some find that meaning appropriate for the Bima and others find it inappropriate. Either way there is valid emotional value to its location. Bima – The Bima is a raised platform or a special area that holds the ark which in turn holds the Torah. Other components can also be found on the Bima including a light source called the Ner Tamid or eternal light, the aforementioned flags, and a podium. Traditionally a synagogue is designed so that all the seats face the Torah which is situated on the Bima, which means the flags are usually in prominent view during worship services. Eretz Israel – The concept of Eretz Israel or “Land of Israel” is the historical understanding of Israel. This term refers to the Israel of Abraham and Sarah. This is the Israel that Israelites wander towards after their Exodus from Egypt. This term is more of an idea than a boundary, it’s a promise of living in a land wide with milk and honey and a home where Israelites have a relationship with Adonai. Am Israel – The concept of Am Israel or “People of Israel” is a term that refers to Jews all over the world. Every Jew is a part of Am Israel a member of a huge Jewish community. Medinat Israel – The concept of Medinat Israel or “State of Israel” refers to a modern and political Israel; an Israel with a government and set boundaries. Israelis live in Medinat Israel and not all of the Israelis are Jews. The boundaries of Medinat Israel can be seen on a political map, and those boundaries have been and some continue to be hotly contested. Zionism – The concept of Zionism is a political and nationalistic movement of the establishment and support of a Jewish homeland in the territory defined as Eretz Israel. Anti-Zionism – The concept that Jews have no right to establish a homeland in the territory of Eretz Israel, because it is already inhabited by a local population. There is more than one perspective for not having an Israeli flag on the Bima. The first one is that if the flag represents a Medinat Israel, than it’s not appropriate for a prayer service. Medinat Israel is a political conversation and political conversations have their place among Jewish rhetoric, but not at the cost of the sanctity of services. Judaism is already appropriately represented by the Ark, Torah, and Ner Tamid, the flag is an unnecessary and divisive symbol. The second perspective is that the flag supports the Israel’s government policies. However, not all of Israel’s policies are popular; policies on security and settlement are especially controversial. Many of these controversial policies involve Israel’s relationship with the Palestinians, a local Arab population inhabiting the territories of West Bank and Gaza Strip. Some people believe that the members of West Bank, Gaza Strip, and Israel should be citizens with equal rights in a One State or Bi-national solution. Other people argue for two independent autonomous states, a State of Israel and a State of Palestine in a two state solution. Either way the autonomy of the Palestinians is hotly debated with unyielding and violent results. The Israel government has approved of establishing Israel settlements in areas demarcated as Palestinian Sovereignty. Extremist Palestinian individuals and organizations have bombed and rocketed Israel towns and urban centers. An example of this conflict can be found in the city of Hebron. Hebron is clearly within the West Bank border which is inhabited by 175,000 to 250,000 Palestinians and 800 to 850 Jewish settlers, who live there because it’s the burial place of the Biblical Patriarchs. Hebron is famous for a place of conflict between the Israel Defense Force and the Palestinians. Many Jews feel the Israel government’s treatment of the Palestinians is antithetical to Jewish values and the Palestinians are an abused people who are underrepresented by the international community. They feel the Israeli flag is supporting the mistreatment of the Palestinians. Furthermore, they say how could Jews who survived the Holocaust, support the abuse of another people, by placing an Israeli flag in a prominent place of the Synagogue. Many people see the Israeli flag as a symbol that represents Eretz Israel, Am Israel, and Medinat Israel all in one. The Israeli flag is a celebration of the Jewish homeland, established after years of persecution and displacement. In fact many people feel that Judaism will not survive without the state of Israel. There are a number of perspectives supporting the placement of the Israeli flag on the Bima. One perspective is that the Israeli flag doesn’t just have political meaning. They feel that the Torah, Ner Tamid, and the Ark are important but old symbols of traditional Judaism while the Israeli flag is a necessary new symbol for the unity and continuation of the Jewish people. A second perspective feels that the Israeli flag is making an important political statement that is appropriate for the Bima. The placement of the Israeli flag on the Bima shows how much their community supports Israel’s policies and actions. This perspective ranges greatly on what that support looks like. Some people whole heartily support all of Israel government’s choices and policies, no matter how controversial or unpopular. While other people do not support all the choices that the Israel government makes, may still supports Israel and its government. In fact some may fervently disagree with how Israel interacts with Palestinians but support the presence of the flag, because it means so much more to them than just the conflict between Israelis and Palestinians. A third perspective is that the flag isn’t just making a political statement, but an Israel statement. They feel that there is so much more to Israel than its politics. Israel is a place of rich culture, ideas, and attractions for Jews and non-Jews alike. For them the flag is a symbol for Eretz Israel, Am Israel, Medinat Israel, plus fourth Israel, called Clal Israel or “whole” Israel. It represents the Israel experience which is unique for everyone and transcends politics. This perspective is its own mini-controversy. If a community decides that they want to keep the Israeli flag in the synagogue, but not on the Bima, then where will they put it? This perspective feels that there are many places in the synagogue that have emotional value. For example the oneg is an important Jewish gathering that normally is not in the same location as the service. It has emotional value without the sanctity of a worship service where almost all types of conversations are appropriate. Religious school classrooms could also be an appropriate location for Israeli flags. In classrooms the Israeli flags could engender conversations about Israel to students, which include positive Israel experiences and controversial Israel policies. Below is a list of questions a community can use if they want to have meaningful conversations that reviews their congregants’ perspectives in order to get to a solution. These questions were developed by Dr. Isa Aron from her book The Self-Renewing Congregations: Organizational strategies for Revitalizing Congregational Life. How does each perspective understand this controversy? What are some reasons why this controversy has emerged at this particular time? Think about how this controversy has arisen in your community, and take a few minutes to write in your own words a statement of the controversy. Write out these statements on a flip chart so people can compare them. (If these statements are very different) what are the key elements that contribute to this controversy? What values and assumptions lie behind each of these alternatives? What are the pros and cons of each alternative? What are some consequences (both intended and unintended) that might result from each alternative? Which alternative seem most promising for your congregations and why? What are some first steps in pursuing the alternatives you deem most promising? Ideally a Jewish community wants to prevent a Hebron-like situation when discussing whether an Israeli flag sits on the Bima or not, or moved to a different location. Much like the Palestinian-Israeli conflict, one document isn’t going to fix this argument. However, this script is designed to help with something more subtle than positions of different perspectives and something less tangible than the historical facts surrounding the conflict. For many this argument comes down to their feelings over the conflict. That’s not bad, people having feeling, especially about Israel, and they are absolutely valid. Perhaps people’s feeling deserved to be addressed more so than the perspectives of the arguments. Real healing within a community can only begin when each perspective feels heard and validated and then authentic decisions can be built from this foundation.